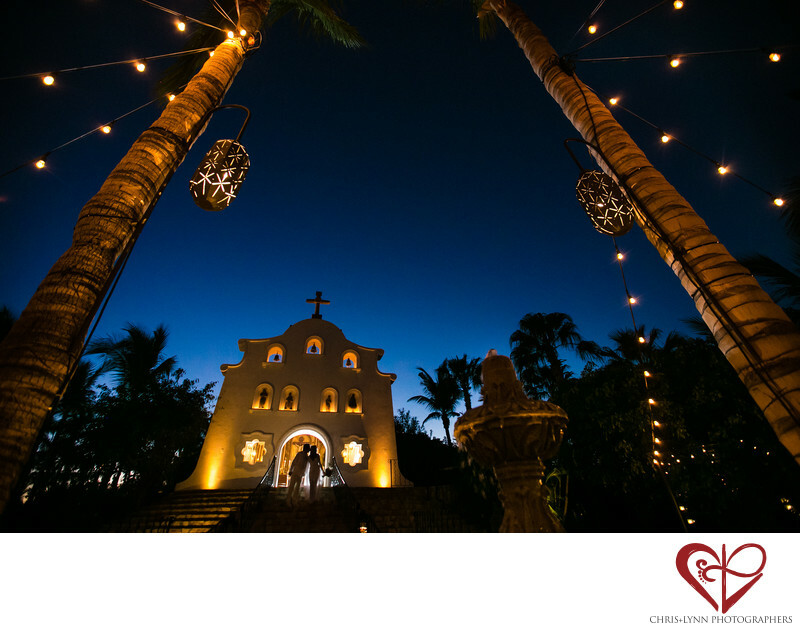 Known as the "Jewel of Baja" One & Only Palmilla is simply a breathtaking location for a Mexico destination wedding. There are many reasons it is consistently listed as one of the world's best hotels by Travel & Leisure Magazine: the luxurious rooms in the traditional Old Mexico style and each with private verandahs, lush gardens of palms, birds of paradise, and other tropical plants, miles and miles of tranquil beaches, and of course, impeccable five-star service. What we love about the One and Only is that there are so many beautiful & private locations for wedding photography within the resort. From a spiral staircase to an ornate fountain to the a rocky promontory on the ocean, there are gorgeous settings around every corner. And its chapel must surely be the prettiest little church in Mexico! Set in a secluded courtyard at the top of a stone staircase, this ceremony venue has carvings and bells adorning its white washed facade. Inside, there are traditional wooden pews and a golden alter. This image was taken after the ceremony after the newly married bride and groom made their exit down the stairs. An off-camera Canon 600EX-RT Speedlite flash was placed behind them to illuminate the doorway and separate them from the background. We love to shoot at twilight when the lights of resort twinkle and their is sill a deep blue in the skies. Location: One&Only Palmilla, Carretera Transpeninsular Kilometro, 23400 San Jose Del Cabo, BCS, Mexico . 1/80; f/2.8; ISO 3200; 16.0 mm.